Following on from last night’s I Puritani, the Welsh National Opera’s production of Handel’s Orlando, directed by Harry Fehr and conducted by Andrew Griffiths, continued the season’s theme of exploring madness. Nonetheless the two operas are very different: Bellini’s I Puritani is full of melodrama, whereas Orlando takes a manic, darkly comic approach to the subject matter. Orlando has an unusual history. The opera is based upon an anonymous libretto which in turn is based upon the unfinished Italian Orlando Furioso by Ludovico Ariosto, where the eponymous protagonist abandons the pursuit of war for the pursuit of unrequited love, going mad in the process. The plot has a reputation for being flimsy in parts, 18th century opera relying upon flamboyance, extravagance, and star performers singing beautiful arias that did not necessarily have anything to do either with plot or characterisation. Storyline aside, Handel originally composed the opera for two castrati (no longer present in today’s opera), two sopranos, and a bass. Consequently it is always a challenge for a modern company to perform. But WNO’s production handled these challenges with panache and an incredible amount of energy. 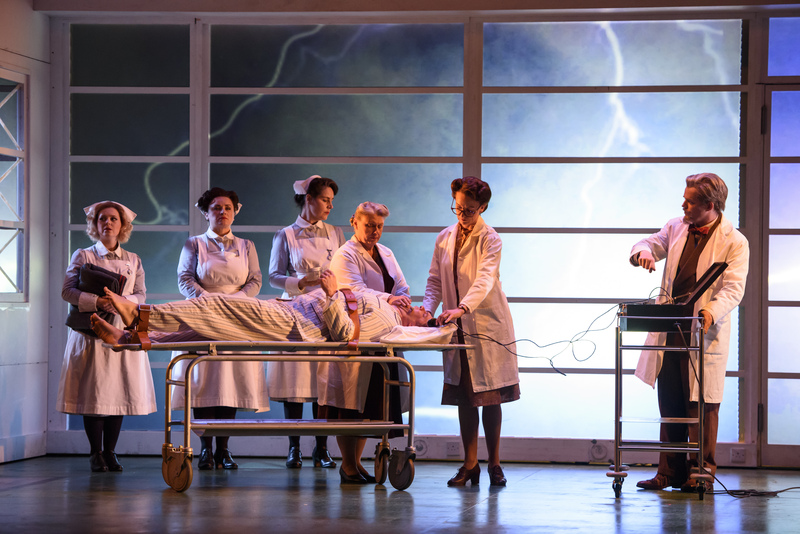 The whole cast made extensive and comic use of the dramatic irony that runs throughout the opera, in a way that played tribute to the original spirit of 18th century dramatic performances (even though the set was a World War II hospital). It was imbued with a spirit of fun, with cast, orchestra, and conductor clearly relishing the performance: in the second act, when some of the orchestra lights faded, they kept playing, professional even though half of them were in fits of laughter. Conductor Andrew Griffiths had a smile on his face through all three acts. At the beginning of Act I, when Zoroastro (Daniel Grice) tries to persuade Orlando (Lawrence Zazzo) out of love, the aversion therapy he employs was a series of slides of King Edward VII and Wallis Simpson, triggering laughs from the audience, ending on an ominous note with a slide of Hitler. The subtext was clear: if Orlando pursued love rather than duty, bad things would happen, as indeed they do — the depth of Orlando’s madness is nothing to be sneered at. Indeed, this first scene was a musical and theatrical highlight in an opera that was consistently impressive. Grice’s Zoroastro was played with mischief and authority, with an excellent sense of comic timing as a twinkling-eyed eccentric doctor. 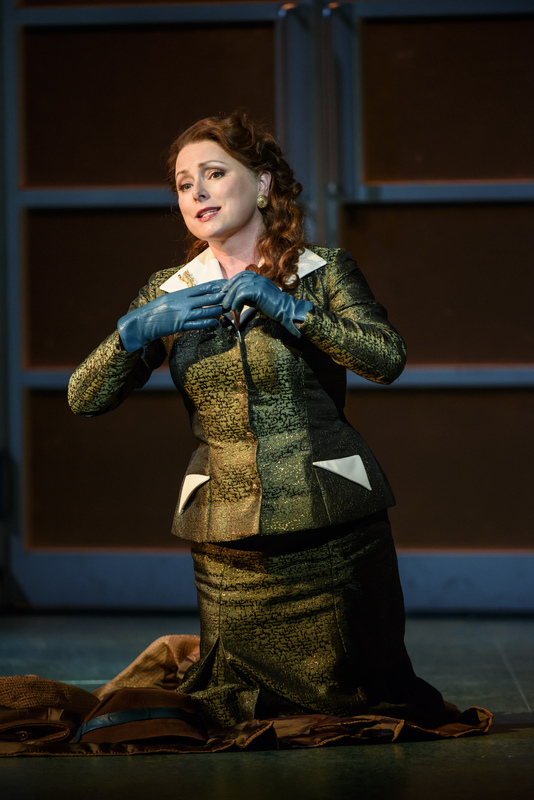 All of the characters in this opera attract the audience’s sympathy at different times, even Angelica (Rebecca Evans), despite her aristocratic snobbery, because of her incredibly moving grief and true love for Medoro (Robin Blaze). Medoro was a little underwhelming when compared to the others, but due to the fiendishly difficult nature of the part was equally deserving of praise as any other. Angelica and Medoro’s duet in Act II where they try and comfort Dorinda (Fflur Wyn) over her unrequited love for Medoro was hilariously done, conveying a real sense of awkwardness and embarrassment at Angelica and Medoro’s shameless, yet beautiful, declarations of love to each other. The unlucky-in-love and pure-hearted Dorinda (Fflur Wyn), for whom one feels genuine pity and sorrow, was very movingly portrayed, with her nightingale aria at the beginning of Act II a particular highlight, exemplifying the notion that love is blind, leading to delusion and heartbreak. The beginning of her Act II aria was traditionally called l’aria di sorbetto, because the music could barely be heard over the audience’s eating of sorbets, and was therefore given to the lesser characters, with lesser music. In Wyn’s poised and masterful hands, no aria has ever been more undeserving of such a name. The truly spectacular element of this production, however, was Zazzo’s portrayal of Orlando’s madness: at times furious and manic; at others sorrowful; and at still other times, with unhinged glee. It was a complex, incredible performance that was utterly riveting, especially the first of his attempted suicides, with a razor. All his arias in Act III were arguably the best in the whole opera — sung and acted to perfection. As the arias’ language became steadily more hyperbolic, the extent of his delusion became all the more apparent, visually emphasised and complemented by the WWII hospital setting. This is an imaginative, sensitive and incredibly compelling production of Handel’s Orlando. It effortlessly manages to balance morbid comedy with a serious, multi-faceted exploration of madness, with an ending that is surprisingly realistic. You are guaranteed to leave with a smile on your face. The Welsh National Opera continues to tour the UK; for more information and future dates please visit their website.